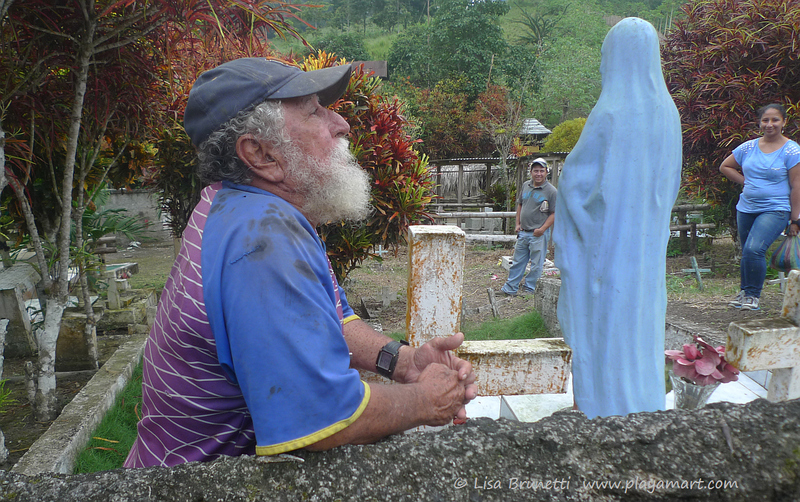 Silvana (of Monoaullador), Bob (of Pirancafe) and I traveled this week to the community of La Mocora where time seemed frozen in sweet acceptance of a basic-yet-rewarding long-ago lifestyle. The camera often captured not only the primary subject but a secondary one as well! He’s figured out sleeping arrangements in hopes that we might stay! “Big Eyes” basks in unconditional love while others watch lovingly from afar. Switching back to life on the shrimp farm, I wanted to capture the essence of the moto taxi ride while showing the flat landscape of the valley. 5 kilometers on a bumpy road is a long ride in the rainy season!! There’s a LOT going on in this image! That’s my friend Jana coming down the steps! Visualizing a great shot through the museum’s glass doors, I wanted to record the paintings being loaded into the truck. 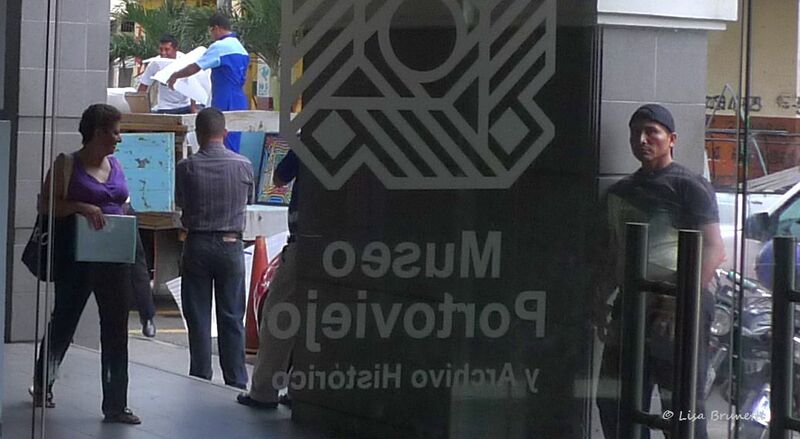 Last August (2012) the Mola Series paintings were transferred from Museo Portoviejo to Museo Bahia de Caraquez. 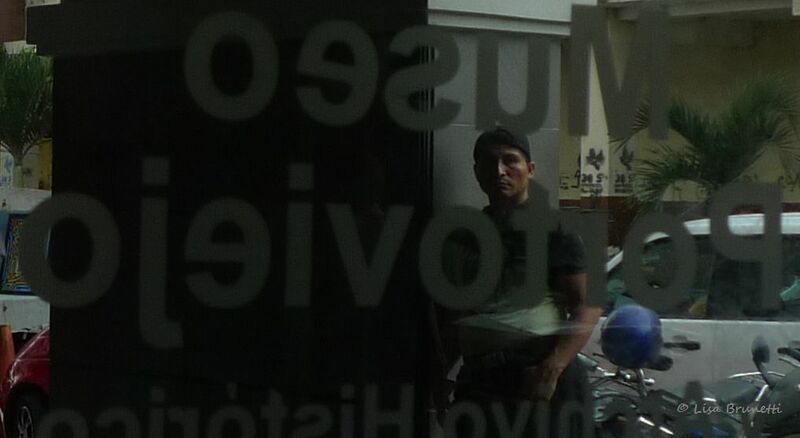 As the staff loaded the truck from Museo Portoviejo’s security door, this man watched from the main entrance. The man in the middleground stole the show with his solemn mood. As a parting shot, here’s one more glimpse of the landscape between my house and town. How lucky was I to upgrade from moto taxi to dump truck! Enjoyed the lesson on perspective using your great images of beautiful Ecuador and the smiling faces of your local friends. Really like those last two photos through the museum’s glass doors. i think that you often photograph nature and animals; i try to record this unique culture and its people as well as nature and animals.. when you’re photographing people, lots of those photo ops are at play. Haha! I agree with lago above. I think my favorite is the Happy Saddle. It looks a lot more comfortable than the plain ole cement blocks. yes, the happy saddle was fun.. wouldn’t it be fun to paint? or maybe not – perhaps impressionism! 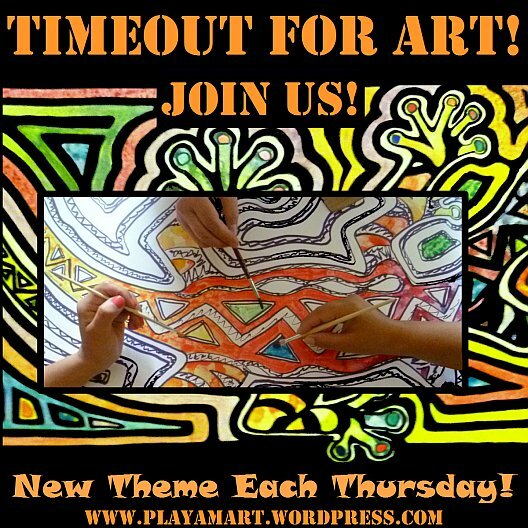 Ooooh..maybe a Timeout for Art challenge? hmmmm. of those colors – wow, it would be lacking without color… HOWEVER>..hmmm, all pencil except that splash of color? 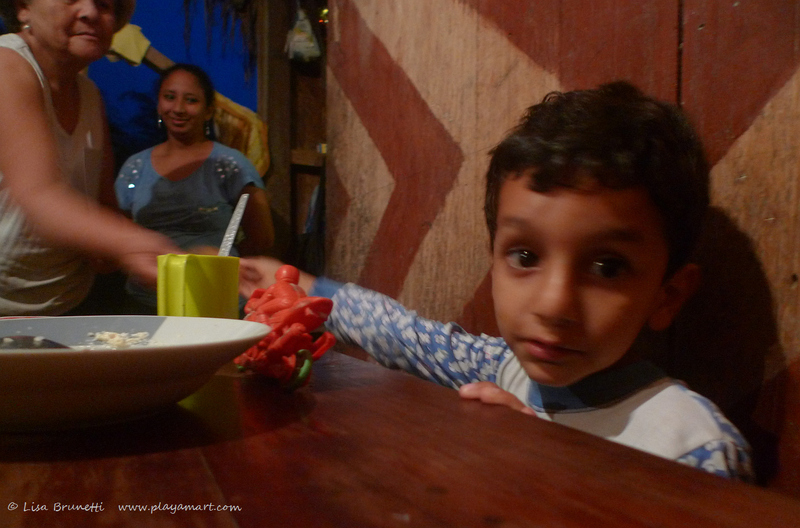 That was a fun afternoon in guayaquil before barb left for panama. thanks! Great post amiga. This was a difficult challenge and you really rose to the occasion. I love the picture of your reflection next to the cat and the driver of the taxi. thank you rosie! i’m lucky to have had so many ops – and this afternoon at lunch, i took even more! thanks! this was an easy challenge for me, and yes, those eyes were amazing!! Great post! Loved the solemn face . I like your approach to the challenge, very good photo like them all, the one with the cat and the last one are my favorites, but they all have good perspective and a story. thank you! that bearded man was quite unique. he lives just across the road from the cemetery, and we were at his family’s section of the cemetery. Visiting his house was an amazing experience as well. so much happens each day- i could post nonstop and never run out of material! thank you! yes, there was something about those museum door images.. i’m glad you liked them.. Yes, it’s a little bittersweet, but I’m so ready to move on. 🙂 Thanks for your kind thoughts, Lisa! you are such a tireless cheerleader! what a grand heart you have, amiga! thank you! These were fun and perceptive captures. 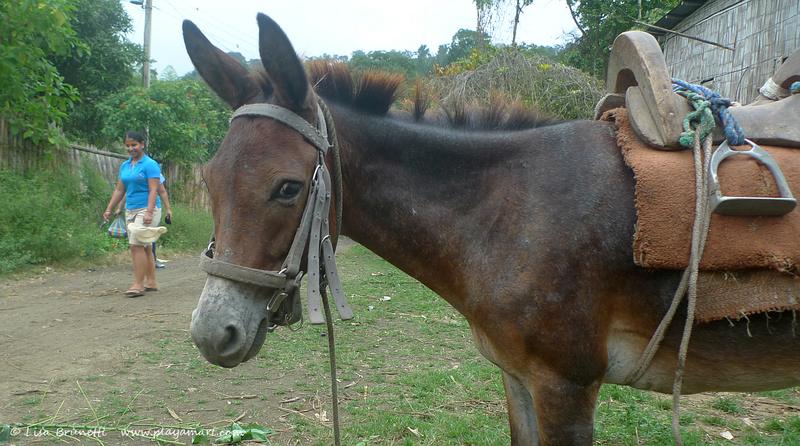 I especially love the mule’s expression! thank you! 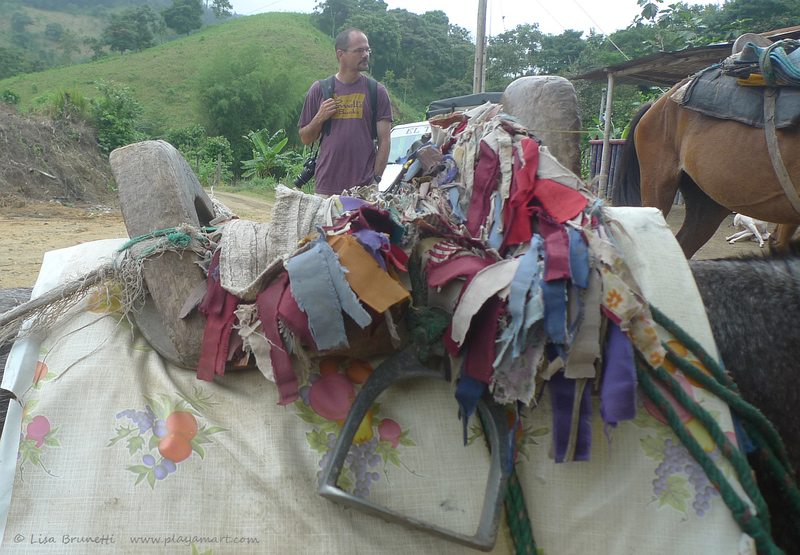 the mule was surely proud that i found him worthy of a photo! oh my! i’m out of the futbol loop (gasp) but really enjoy watching, especially if it’s an important game. thanks for the heads up on that, and of course your comment about the black cat and the reflected image. ja! 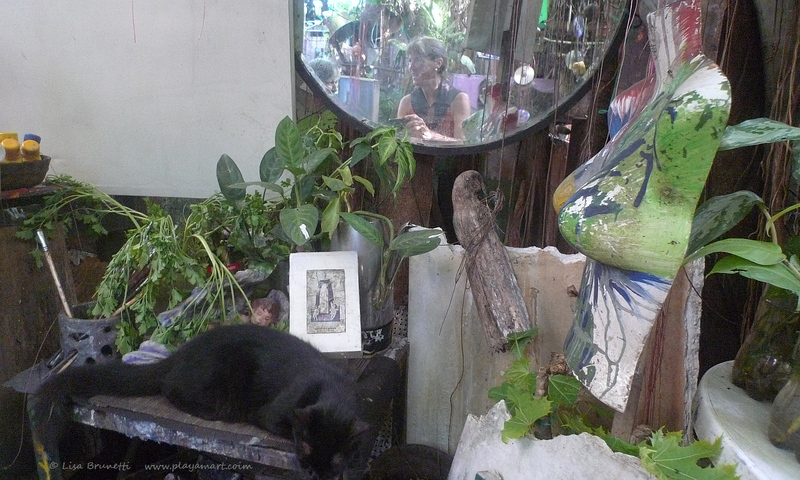 some people call me ‘bruja blanca’ and there i am in the photo with the black cat! i think it’s a trained eye.. since the challenge i realize when i take photos, i am always looking for a secondary subject to put in the background, mainly to lead the eye around the picture.. thanks, amiga! ha! that made me laugh! yes, there are some amazing people in that post.. i am so lucky! 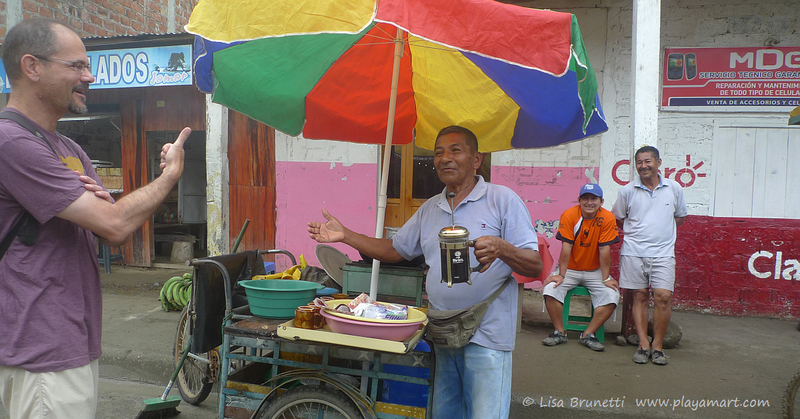 Lisa muy interesantes sus fotos, el senor q esta conla virgin es de la mocora ,yo lo conozco, todo con mucha historia ,q buen recorrido q ha hecho, q bueno q esta conociendo mas culturas y costumbres de ecuador,,, muchas gracias. estamos en contacto. maruja! thank you! grrrrracias!!!! si, esta publito es circa casa su mama! I love your attitude, Lisa… and can see you have a good eye. Thank you! 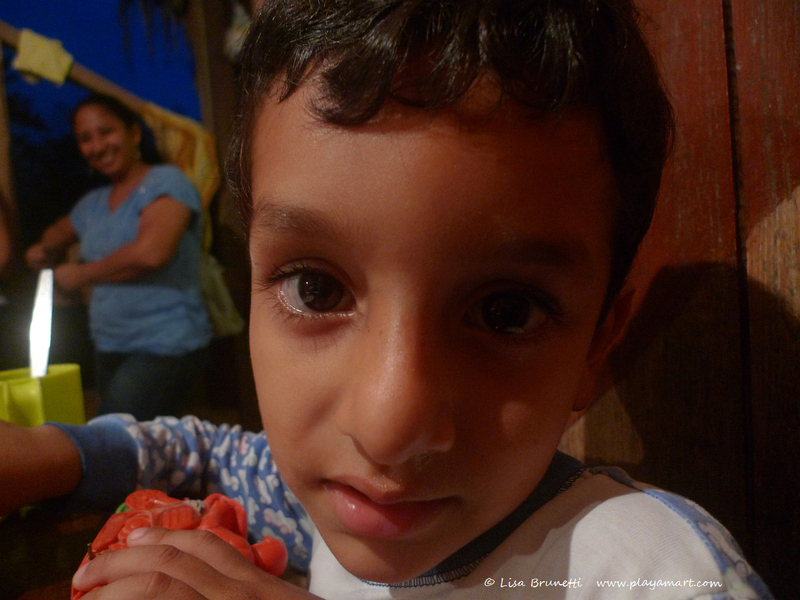 Bob just posted a great summary of the past week here in Ecuador. http://www.pirancafe is his site. Thanks, also, for the time you’ve spent looking/reading my posts!